The Cocktail Revolution meets the Farm to Table movement. 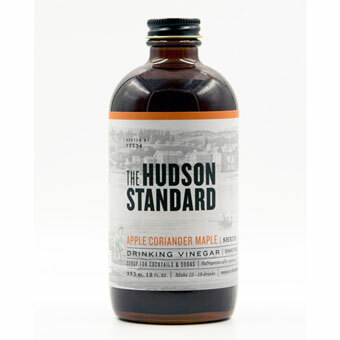 The Hudson Standard's Apple Coriander Maple Shrub comes from a Colonial American tradition of blending fruit, spice, vinegar and sweetener to make a concentrated syrup. This shrub makes a fantastic cocktail mixer, or when combined with seltzer, a delicious natural soda. With apples from an orphaned orchard in the Hudson Valley, organic New York state cider vinegar and local coriander and maple syrup, the shrub preserves some of the valley's best flavors. Ideally suited for bold cocktails made with bourbon, scotch or whiskey, this tart, sweet concentrate can be added to hot beverages, salad dressings, meat glazes and desserts as well. The Hudson Standard, located in Hudson, New York, started from the desire to make high quality bitters and cocktail syrups, called shrubs, using ingredients almost entirely sourced from New York's Hudson Valley. Founder Marianne Courville and her husband Michael Albin moved to Hudson, New York from Brooklyn in 2000 and opened Hudson Wine Merchants. It was there that they caught the bug to start a business making cocktail bitters and shrubs. The business soon became a commitment to the region. The ingredients in their bitters and shrubs are almost entirely sourced from the Hudson Valley. Working with local farms, Marianne and Michael stay open to new ideas about crops, production, sustainability and cooperative ventures. 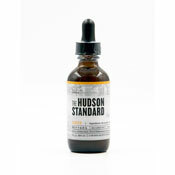 The Hudson Standard is a welcome convergence between the cocktail revolution and the "farm to table" movement.